[Y]ou are crying out for attention. This cheap thrill of having people point and jeer is now acting as a substitute for some other, deeper issue in your life. Back away from camp, go get a chai latte, and think about why you are so desperate for strangers to notice you. This guy might be the worst offender, but he was far from the only one. 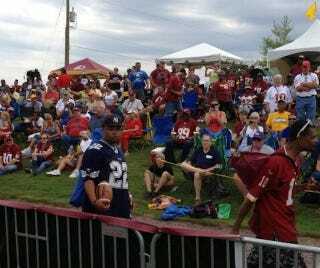 Jake Russell, who took the above photo, noted that he'd "never seen so many Cowboys fan at a Skins practice." D.C. Sports Bog has an entire gallery of Cowboys, Giants, and Steelers fans at yesterday's camp. Hogs Haven has videos of them getting roundly booed. Who are these people, and when do they have to be back at the group home?